My Tuna In Miso On Glass Noodles is a quick and easy Spring fish recipe that is healthy and nutritious! 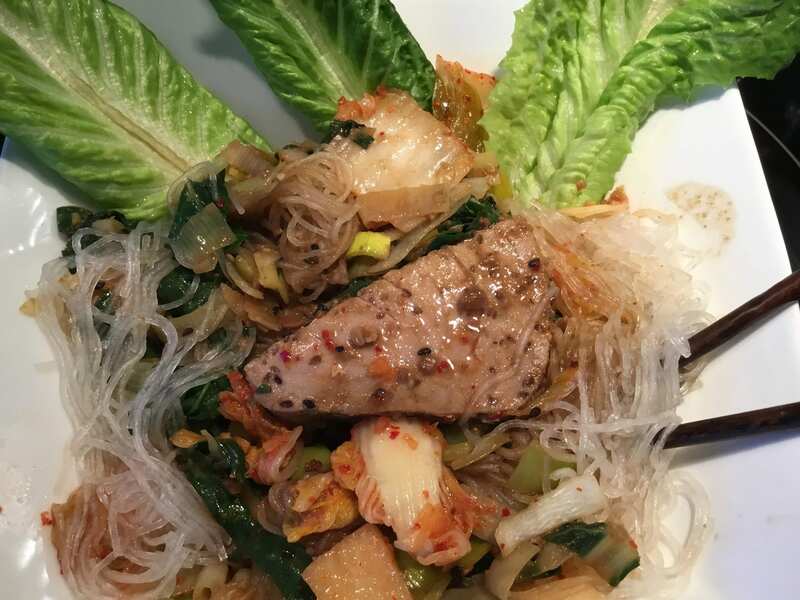 My Tuna In Miso On Glass Noodles features a healthy piece of seared medium rare Ahi Tuna seasoned with ginger and sesame, bathed in a light miso broth and fortified with organic Swiss chard and organic leeks. 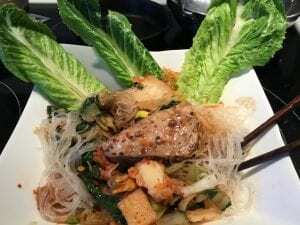 The seared tuna steaks, vegetables and miso broth sit atop a slur of bean thread noodles and are topped with healthy spicy kimchi and romaine lettuce leaves! My Tuna In Miso On Glass Noodles takes minutes to prepare and gives hours of satiated satisfaction! Just delicious, enjoy with a glass of dry sherry or Riesling wine! Enjoy this delicious healthy meal!